In my garden, the daffodils are just green spears biding their time. Down in town, where it’s warmer, there are fat buds. In the supermarkets, the ‘daffs pound a bunch’ season is here and aren’t they cheerful on a dark, windy morning? Oooh, lovely! Given the awful weather heading our way, they're much called-for. Worth every penny (and not many pennies, really). Yes, foul, bitter wind with rain forecast and poor huskyteer scootering down this evening. It is much warmer, though! It's stopped raining now and is warmer than it was this morning, so looking up. How lovely! Mine are just green spears, too. After a sunny morning it's now clouded over and rain expected this afternoon. No wind as yet. Beautiful! The jug is perfect for them. Isn't it? I can't remember who gave it to me. It always takes me by surprise, how early they appear in the supermarkets. But I love them, and buy them every week while the season lasts, for my office and the kitchen windowsill. They all say,'Grown in UK', so I feel it's OK to buy them. 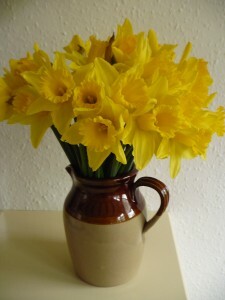 This is so funny: my daffodil jug is almost identical to yours! It's looks a bit squatter and perhaps a hair shorter. It's the only one I put daffodils in unless I have a surfeit of daffs. I haven't bought my first bunch of the year, but I plan to this week. They're lovely! It felt very much more like spring as I walked about yesterday. By the way, belated birthday wishes. I hope you had a nice time, however you celebrated. I don't see many signs of spring except in flowers like those. Thank you! My daughter came down for the weekend and we had a nice time.